Designed for the DAW user that seeks the legendary big sound of an SSL console while retaining the convenience of working in the box, Sigma δelta is a unique rack mounting SuperAnalogueTM mixer with full synchronised control via the Sigma Remote Control Application and Delta-Control DAW plug-ins. Sigma δelta seamlessly brings the analogue joy of mixing on an SSL console into your DAW dominated workflow. Using MDAC technology unique to SSL, Sigma takes the SuperAnalogueTM mix buss from SSL's Duality and AWS consoles and delivers it in a 2U rack design, with complete remote control of the analogue signal path, using either a hardware control surface and/or a simple Remote Control Application, and/or directly from your DAW using the innovative SSL δelta-Control (δ-Ctrl) plug-in. Now anyone who can drive a DAW can mix on an SSL. Consistent feedback from the world's leading producers demonstrates that analogue summing still brings a record together in a special way that no emulation plug-in can match. 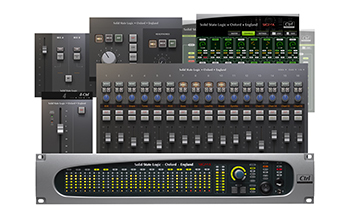 Sigma δelta and SSL's no-compromise approach to designing audio circuits, delivers summing with an extended low-end frequency response, wide stereo imaging, clarity, depth and detail. When it comes to sonic tone and character many leading engineers state that a significant part of their 'sound' is the magic that happens when you drive the analogue mix buss of a console a little too hard...that delicate cohesive distortion only a pushed analogue mix buss brings their mixes. This is exactly the case with Sigma. It is at its best when pushed to that "sweet spot", to the point where it yields that extra sonic dimension which has always been part of the legendary SSL sound. Sigma δelta combines its true analogue tone and depth with complete integration into a DAW dominated workflow. In today's commercial environment, fast turnaround of productions, with multiple mix tweaks and revisions, engineers and producers depend upon instant recall of all their settings. Sigma meets this demand. As Sigma's levels are driven from your DAW, the mix recalls instantly upon session load. Furthermore, every setting on Sigma itself (mix buss routing, monitoring section and settings) can be saved and recalled at the click of a button. Sigma’s versatile dual mix buss, individual direct output and insert architecture also provides a streamlined means of applying analogue signal processing within your DAW workflow and simplifies printing processed material back to your DAW. 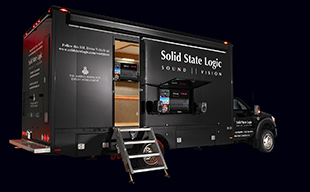 Sigma δelta also features a dual output studio monitor and headphone switcher and talkback system which is completely remote controllable. Sigma is setup from a cross platform Remote App that offers full standalone control of Sigma δelta. Running on a Mac, PC, or iOS tablet the app also performs as a superb remote control for the monitor switcher/talkback. Sigma Delta offers integration into multiple studio workflows and setups. Sigma Delta plug-ins provide streamlined implementation with Eucon enabled control surfaces such as Avid® S3, S6 and Artist series or the Pro Tools Control app. Sigma Delta’s plug-in parameters map across Eucon control surfaces via the Insert editor, meaning that users can easily move between controlling their summed Sigma mix and their DAW session from the same surface. The Sigma δelta mix engine can also be controlled from any SSL MCU-compatible control surface. Sigma’s MCU control requires no DAW software to be active, it simply requires the Sigma Remote to be running and a SSL control surface to be connected via a Network cable to the same DHCP server or router that Sigma is connected to. The Nucleus/Sigma fusion becomes a fully integrated 32 into 4 automated line mixer, with full monitoring and talkback capabilities. Sigma can also be used in combination with Duality, AWS and Matrix to add additional automated mixing capacity. Inserting Sigma δelta across the insert points of an XL desk, instantly adds automation to the console.